Good afternoon, Ladies and Gentlemen! Matthew here. We apologize for the delay in posting this, but we were pretty worn from our journey last night, so my body decided you fine people could wait an extra day. Our last day in San Francisco was a short, but busy one. After checking out of our Airbnb (which was an interesting one - see Day Four's entry), we began the day (as is usual) with a coffee run. This morning's choice was Biscoff Coffee Corner on Pier 39. This gave us the opportunity to experience the piers during the day. We had briefly walked along The Embarcadero at night, so we got to see a few of the lights and peeked into a few of the shops, but most of them were already closing, so we couldn't stay long. Pier 39 with some birds making their way into our photo. It's a carnival atmosphere. People are everywhere. Little shops cover every square inch, lights are strewn about overhead in a haphazard fashion, music is playing and sea lions are barking in the distance. Yes, sea lions! We got to see to the famous Pier 39 Sea Lions. They were absolutely hilarious to watch and hear. They get riled up and shove each other off the docks all while barking like mad at one another for reasons unknown to me. Next, we headed out to find North Beach Gyros. This was quite a walk and I had tweaked my knee at some point the day before, so it was a slow walk. If you've been out and about with us, you know our normal walking pace is anything but slow. We're not quite sure why that is, but moving that slowly was torturous. Either way, the trek was very much worth it. This was absolutely phenomenal, and receives top marks in my book. If "the toppest of marks" was a valid phrase, I would have used it there - it was that good. We started with a Falafel order, which was a first for both of us. I am very proud of my wife for sampling (and enjoying) this. Her culinary decisions tend to lean toward the adventurous side when we are on vacation. No complaints here! 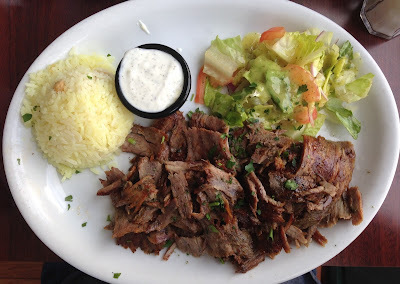 As you can see in the photos above, alongside the Falafel appetizer, I had the Lamb and Beef Gyro plate and Valeri had the Chicken Gyro plate. (I'm not saying mine was better ... but mine was better!) If you're ever in the North Beach area, definitely check this place out. The service was great and the food was amazing. This was the perfect last meal in San Francisco. After cramming our faces full of gyros, we had to make the trip to the airport. We didn't have the rental car today, so we hopped on BART. This is how the natives travel, so it's always kind of fun (as long as you can secure a seat). There isn't much to say about the journey at this point, so I'll fast-forward to the airport. San Francisco International (SFO) is a very nice airport - especially for being as big as it is. The layout is logical and very easy to navigate. As an added bonus, the TSA agents actually smile! We had arrived a few hours early, so we milled around the airport for a while, then sat and waited ... and waited ... and waited. Finally it was time to board! Three hours later, it was wheels down at Kansas City International (MCI). Our friend was at the terminal gate waiting for us (in his new Mercedes C250, no less), so making the journey back home was underway. All of this put us in at around 2 a.m. this morning, which is why this blog is just now being posted. We like sleep. I can officially sat the Pearons have survived San Francisco! Or did San Francisco survive the Pearons? I'll leave that decision up to you. "San Francisco itself is art, above all literary art. Every block is a short story, every hill a novel. Every home a poem, every dweller within immortal. That is the whole truth." To view our PhotoStream, click here.